Overall Condition Very good. 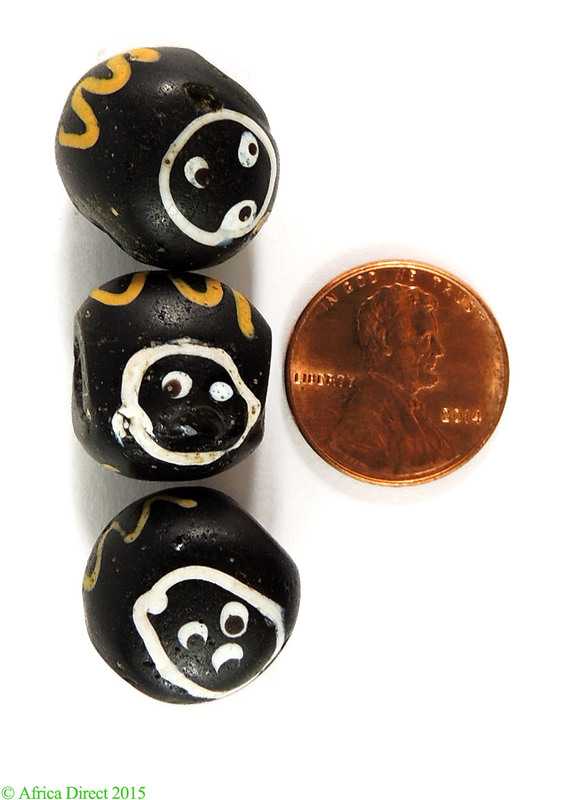 Some of our beads have traveled at least three continents, and have graced numerous owners. Small chips, corrosion, and pitting are a normal part of their patina attesting to their age and extensive use. Bead Size 16-17 mm diameter. See picture with penny for size comparison. Additional Information: The term "Trade Beads" typically applies to beads made predominately in Venice and Bohemia and other European countries from the late 1400s through to the early 1900s and traded in Africa and the Americas. Many of these beads have been attributed to being made in Germany, France and the Netherlands as well. The popularity of these beads was revived in the late 1960s when they began to be exported from Africa into the United States and Europe. The term "Trade Beads" became very popular during this time period and is still used for the same bead reference today. The millefiori beads were also called "Love Beads" and used in necklaces with peace symbols during the Hippie days. As the popularity and availability of these old beads grew they started getting "named". We started hearing terms like "Russian Blues", "Dutch Donuts", "King Beads". Although some of these folklore names are totally meaningless...ie...."Lewis and Clarke" beads, they do describe a specific type of bead. And today these beads are more popular and collectable than ever. Thousands of these beads are in private collections around the world. 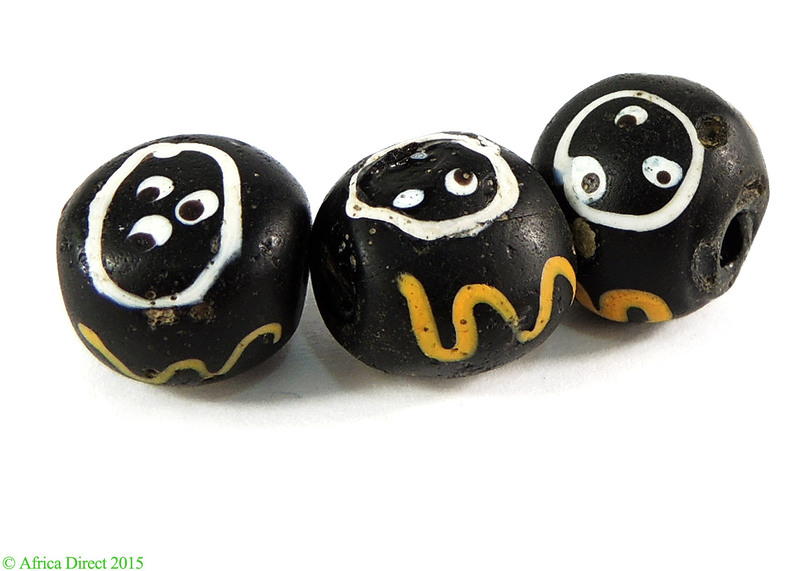 The African Traders are having to go deeper and deeper into Africa to find more of these beads and many styles which were readily available just 5 years ago are no longer seen today. To learn more about "trade beads" please read, The History of Beads (Dubin), Collectable Beads(Liu), Ornaments From the Past: Bead Studies After Beck (Bead Study Trust), The Bead Is Constant (Wilson), Arizona Highways (July1971), Africa Adorned (Fisher) and the John and Ruth Picard series of books; Volume III - Fancy Beads from the West African Trade, Volume IV - White Hearts, Feather and Eye Beads from the West African Trade, VolumeV - Russian Blues, Faceted and Fancy Beads from the West African Trade, Volume VI - Millefiori Beads from the West African Trade and Volume VII - Chevron and Nueva Cadiz Beads. There are exceptional museum collections of trade beads at the Museum of Mankind in London, the Pitt River Museum in Oxford, the Royal Museum of Central Africa in Belgium, the Murano Museum of Glass in Italy, the Tropical Royal Institute of Amsterdam, and the Picard Trade Bead Museum in California, US to name a few. 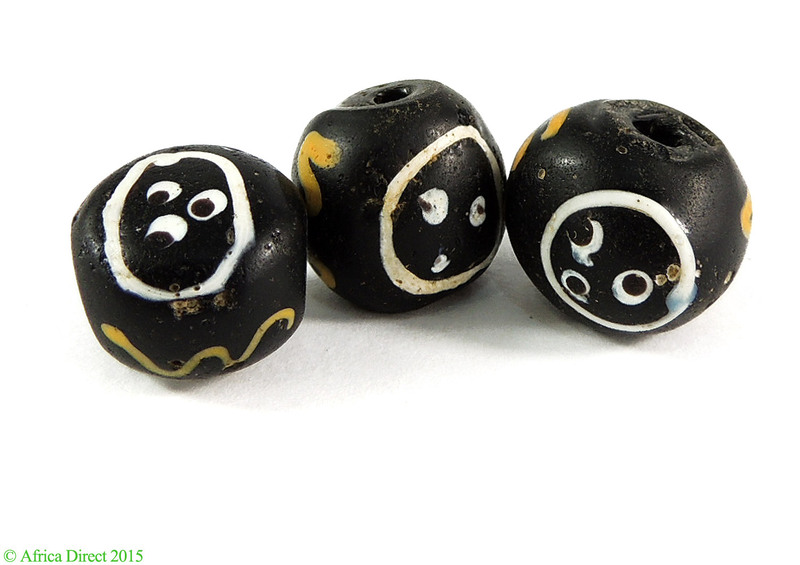 One of the most intriguing aspects to these beads is how they have survived a hundred or more years of wear and the travel through at least three continents. Another mystery is who wore them before us who will have them next.......after us.